Lomié itself is a Bantu village, but the majority of villages surrounding Lomié are Baka ‘pygmy’ encampments. You don’t need to be a genius to see that the Baka are the most historically, economically, and politically marginalized group in Cameroon. Given their immense marginalization and staggering poverty, I’ve begun to create a few projects for the amelioration of health (doing health talks as well as a soy plantation and a beekeeping project) in Lomié’s surrounding Baka encampments of Adjela, Pollidor, and Poempum. But before I delve into future posts about my work in these encampments, I figured it might be useful for you to get a glimpse into their culture, life, and livelihoods. 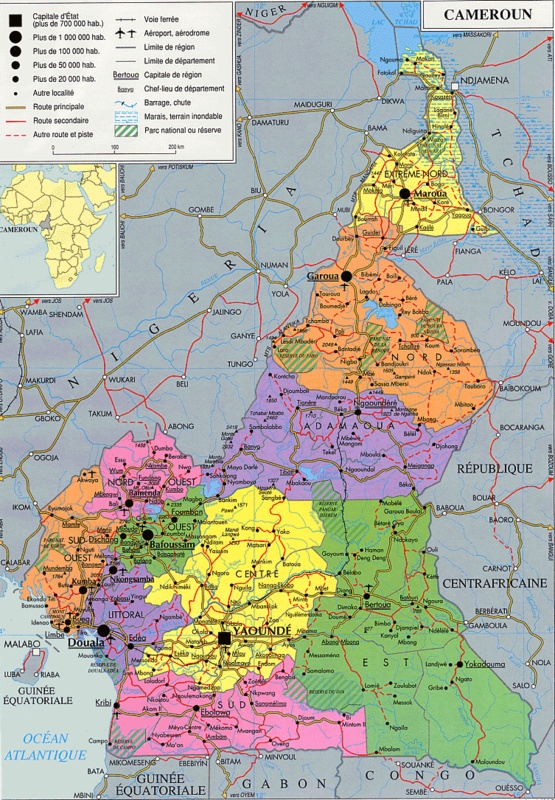 The Baka are about 30,000 strong and their population stretches out to Gabon, Central African Republic, and Republic of Congo, but it is centralized here in Eastern Cameroon. Everything about Baka life is adapted as a result of their nomadic rainforest life. Their short stature (~5 feet) is perfect for walking through the dense rainforest. Baka houses differ from the Bantu houses of the Zime around here because they are made from all natural rainforest materials, making it easy for them to build them and then leave them when the season necessitates that they move. The Baka huts, called móngulu, are traditionally built by the females. They are shaped in a hemisphere with flexible branches and leaves from Marantacae plants. The new, square houses can be built by either men or women. 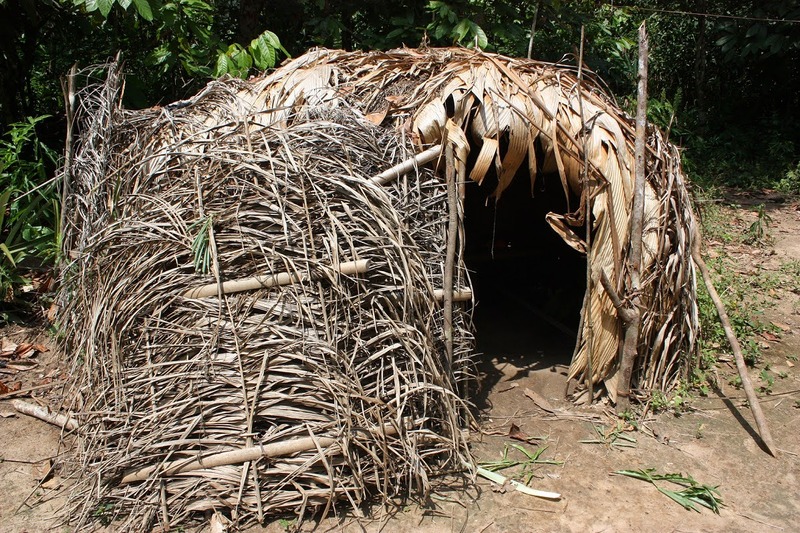 Given that the house is made of entirely natural materials, it isn’t particularly weather-resistant, and there are often a lot of gaps, allowing for many mosquitoes, which explains why so many Baka contract malaria. Inside each hut is typically a bed made of large bamboo (which is surprisingly comfortable), a fire that is used to both warm the house as well as to cook, and their few hunting materials. The huts are round, short, and often lack a door. When a Baka leaves their house unattended, they merely signal that the non-existent door is closed by placing a large palm frond diagonally across the opening. The Baka are also matrilocal, meaning that with marriage, the husband moves to the wife’s village. Baka tend to marry and give birth young, since the well-being of the family depends on labor. Ironically enough, while the strength of the family is its numbers, it is also its downfall. While more kids means more hands to help hunting and farming, it also means more mouths to feed. The Baka continue to live by mostly hunting and gathering. While some sedentary agriculture is being introduced, they prefer to live as they historically have. The men often go into the rainforest for days on end to hunt, while the women stay back and participate in dam fishing, growing cassava, plantains, and bananas, gathering local fruits and foraging for wild mushrooms. Most Baka work, however, as 'slaves' on Bantu farms. Baka are also renowned honey experts. While beekeeping is a popular profession in Cameroon, the Baka don’t practice beekeeping, instead they forage for wild honey from natural bee hives in broken down, hollow trees. One Baka told me how he loves to gorge himself on honey when he has a stomach ache, or when he is exceptionally hungry. In addition to hunting and gathering and being overall experts of the forest, the Baka also possess exceptional medicinal knowledge. Each Baka encampment has a traditional doctor whose medicines are what he derives from nature. From conversations with him, every plant is a cure for one thing or another. While they have a vast wealth of medical knowledge, they still appreciate modern medical advances (the traditional doctor in the Adjela encampment uses a mosquito net - Yay!). Yet even so, malaria, yellow fever, TB, and malnutrition are rampant in each camp. Malaria is hard for the Baka to escape, given that their houses have so many gaps. Malnutrition is so prominent given that food intake depends on food availability, and unfortunately, the food available through foraging doesn’t offer a particularly nutrient-rich diet. Singing, dancing, and art are also a vital part of Baka culture. Many Baka are involved with helping my friend Yackouba make his rattan furniture. There is also one man, Remy, who makes gorgeous wooden sculptures (pictures to come in the future). Baka seem to always be singing or humming, and they are not ones to turn down dancing during celebrations. After making a few trips to the Baka encampments near Lomie and talking about their needs, I am starting monthly health talks on malaria and nutrition and trying to get them to start keeping records on who is sick and with what so that the Catholic hospital can know and they can better monitor severe cases of any disease and malnutrition. I'm going to start having cooking classes in order to show how to preserve nutrients in the local food and to utilize nutrient-rich ingredients and plants in their cooking. I'm also going to be starting a group of Baka who are interested in contemporary beekeeping. Traditional beekeeping is preferred by the Baka, but it only produces enough honey for individual consumption. Income generation is a major struggle for the Baka, so contemporary beekeeping would not only give the Baka more of something that they love (honey), but it would also benefit the other nearby crops, and would additionally be an easy way for them to generate more income in order to afford mosquito nets and more nutrient-rich foods. I’m only just getting into my work with the Baka, and I have barely scratched the surface of their very old culture. While the Baka are often looked down upon in Cameroon (I heard one Bamileke Westerner claim that the Baka were short because it was their curse for having ancestors who were slaves who fled from ancient Egypt - hmmmm), and are often despised for being ‘lazy’, they are in fact a very kind group of people who are more than happy to share their lives, culture, and a whatever they have to offer. I’m looking forward to collaborating with them, and hopefully learning some of their impressive dance moves.